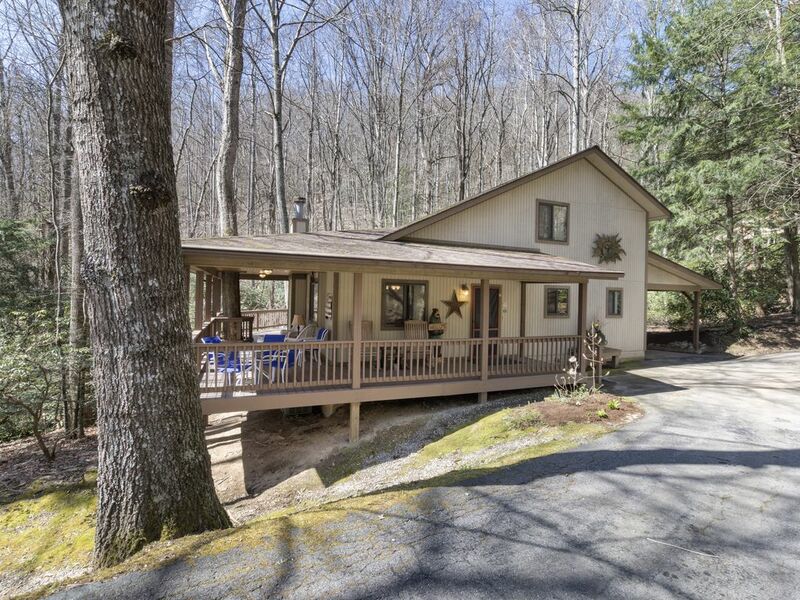 Creek 'n' Woods I is a Smoky Mountain vacation rental cabin in Maggie Valley, NC. This 3 bedroom, 2 bath cabin sleeps 6 - 9 people, and is fully furnished-all you need to bring are your clothes and food. The cabin is located on a creek (very kid friendly) in the woods, and whether you're sitting on the large open deck on the back of the cabin, the smaller open deck off the second floor, or are sitting in the rocking chairs on the L-shaped covered porch-the soothing sounds of the creek can be heard. The hot tub is also on the back deck, and at the end of a full day of exploring all that there is to do in Haywood County and the surrounding areas, it's a great place to submerge and soak away the cares of the day (or the sore muscles and possible bruises from skiing or snowboarding). The gas grill and an extra tank are on the back deck for your use. Creek 'n Woods I is on a paved road and accessible year round. The kitchen is fully equipped. There are movies, puzzles, books, and games for your enjoyment, and WiFi and expanded cable are provided. We take great care of our guests from the moment you call to make your reservation to meeting you upon your arrival no matter what time of day or night that might be. After driving 4-13 hours the last thing visitors to our area need to face is the 'hunt for the cabin'. When we meet you, we take you to the cabin so that we can explain how everything works, provide directions to the grocery store, suggestions on where to eat, and what to do. For our motorcycle guests, we will even do your grocery shopping if you email us your list in advance thus eliminating multiple trips to the store for 'provisions'. If someone in your group is celebrating a special occasion (birthday, anniversary, graduation, marriage proposal, wedding) we will do whatever we can to help make the occasion special by providing a cake, decorations or the names of local businesses who can meet your needs. Creek 'n Woods Vacation Rentals is committed to making your vacation memorable, special and all that you hoped it would be. When your calendar, mind and body need some mountain time and a getaway, call us! We got married in Maggie Valley in 1996. We fell in love with the mountains and decided that we had to move here from Ft. Myers, Fl. Life is wonderful here!!! Maggie Valley gives people the opportunity to enjoy the beautiful Great Smoky Mountains. There is no better place to vacation than by a rushing stream, listening to the white noise of the waters and looking into the faces of the surrounding mountains. Why not have a vacation rental in a place like this? Various and many books. Take any books you start and don't finish during your stay. Located on the grounds of the Maggie Valley Country Club. Open to the public. 1 king, 1 queen, 2 twins, 1 queen sleeper sofa and 1 single bed roll away. A child's crib is available upon request. Hot tub, golf close by, creek side, large open deck and a covered porch. All the basics are provided in this cabin. All the paper products, detergents, trash bags, basic spices and condiments and even starbucks coffee and biscotti. The cabin was everything we wanted and couldn't have asked for more. This was out second time in this cabin and we have stayed in all of Tom and Sue's cabin over the last few years and wouldn't book with anyone else!! We are so glad you enjoyed your stay with us again. We look forward to your fourth stay. Thank you for choosing to stay with us. We appreciate your business. Property is nice. Walk around deck overlooking creek. Very comfortable, clean and accommodating. Hot tub was perfect relaxation after a long day of snow skiing at Cataloochee. To start let me say that the hosts, Tom & Sue, are spectacular. I couldn't mention them enough to let someone know how wonderfully they take care of their guests. Erin met us to show us the house and was extremely professional. She made sure we were completely comfortable before departing. The house is everything as advertised and more. We stayed cozy throughout our stay. We were lucky enough to have a little snow and enjoyed it while sitting in the jacuzzi on the back deck while listening to the creek flow twenty feet away. Our first day was spent on the ski slopes (10 minutes away) which was entertaining to say the least. The next couple of days we spent hiking and touring the local breweries. Don't miss out on the waterfalls too. We did lots of cooking while there and the kitchen had everything we could have wanted and more. The local grocery store is just a short drive away. If you need anything while there, don't hesitate to ask your hosts. They are extremely helpful in assisting you make the most out of your vacation. We are planning to return this summer and hopefully for years to come. You can't be disappointed by anything available to you if you stay with Tom & Sue. We really enjoyed staying at Tom & Sue's cabin! From the very start, they were friendly and easy to work with to schedule our family vacation during the Christmas holiday. The cabin is in great shape, with a full kitchen, laundry, and plenty of room for our family and a guest (8 in all). It's in the beautiful western NC mountains, just off a golf course, and 10 minutes from winter ski slopes, and a half hour from Cherokee with it's waterfalls and local attractions. We've traveled around the US and Europe for years, and stayed in all kinds of hotels, B&Bs, and hostels, and this was definitely one of our favorites! Thanks Tom & Sue! We are so glad you enjoyed your stay with us. We look forward to your next visit. Great! Very clean and well stocked through out! Nothing is too far from Maggie Valley! We have beautiful mountain golf at the Maggie Valley Club, The Wheels Through Time Museum (one of the finest car and motorcycle collections in the country), the Blue Ridge Parkway, Great Smoky Mountains National Park, Harrah's Cherokee Casino, Cherokee Museum, the Biltmore Estate, Cataoolchee Ski Resort, whitewater rafting, horseback riding, fishing, gem mining, shopping, music, and more.